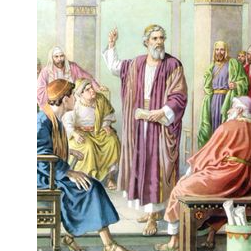 Summary: When Saul of Tarsus first experienced God's grace it turned him into a man of prayer. Even now, perhaps two decades or so later, we find him still on his knees. Paul has been singing the praises of the God of all grace. The Christian’s life is anchored in Jesus Christ. From our election in Him before time began, to the final salvation of which the indwelling Spirit is the guarantee, everything we need to live “to the praise of His glory” (1:12, 14) is found in Christ. His grace makes us rich with the blessings of redemption, forgiveness, adoption, and spiritual illumination. These are, in Paul’s beautiful expression, “the riches of His grace, which He lavished upon us” (1:7-8). The resulting fruit in our lives is diverse: humility in the face of God’s eternal election; sanctity in our lifestyle because He has chosen us to be holy, stability because we know we are anchored into the eternal heart of God; doxology (a hymn, verse, or form of words in Christian liturgy glorifying God) because we have been so richly and fully blessed. When Saul of Tarsus first experienced this grace it turned him into a man of prayer: “The Lord told him, “Go to the house of Judas on Straight Street and ask for a man from Tarsus named Saul, for he is praying” (Acts 9:11). Even now, perhaps two decades or so later, we find him still on his knees: “For this reason I kneel before the Father” (Ephesians 3:14). The adoration of the Lord in His grace always led him to intersession for his brothers and sisters. Notice verse 15 begins with “For this reason,” thus connecting the phrase with what preceded it. Paul prays with thanksgiving for the Ephesians (and presumably others in the same region who received his letter). He has been told about their transformed lives. Two features dominated the report he received about them: their “faith in the Lord Jesus” (trust in Christ as the Divine Son of God) and “their love for all God’s people” (the saints). The kind of love he is referring to is not sentimentality or emotionalism of any kind, but “caring”—caring for other people because God has cared for us by giving us Christ. These make up the two features Paul always seemed to look for as marks of genuine conversion (as his frequent reference to them in other passages indicates: see 1 Corinthians 13:13; Galatians 5:6; Ephesians 6:23; 1 Thessalonians 1:3; 3:6; 1 Timothy 1:14; 2 Timothy 1:13; 3:10; Titus 2:2; Philemon 5). Authentic Christianity always transforms both the Godward and manward dimensions of life. Otherwise, our professions of faith are hollow. But, in addition to this, it is also clear that Paul’s prayer life was fueled by news about his fellow Christians. A glance at the number of names mentioned in his other letters indicates how much he seemed to know even about churches he had not personally visited. The closing greetings of his letter to the Romans are a remarkable illustration of this. Paul well illustrated the lifestyle he wanted to see in others: he prayed for them because he shared their love for all the saints. In passing here we might note Paul’s knowledge of his reader’s spiritual growth, but the absence of personal greetings, tends to confirm that this was indeed a ‘circular’ letter and not one written specifically to Ephesus. In verse 16, Paul reminds these believers that he gives thanks for them in his prayers. This is another feature that marked his prayer life: his thankfulness: “I have not stopped giving thanks for you.” First of all Paul gives thanks to God for the Ephesians. They were on his prayer list, and I guess all the churches were. These are the words of a man who is marked by God’s grace. Gratitude is always the result. According to Dr. Luke, Paul wept with the believers at Ephesus when he took leave of them. He loved them, and they love him. When Saul of Tarsus first experienced God's grace it turned him into a man of prayer. Even now, perhaps two decades or so later, we find him still on his knees.